Kicksparks are a lightweight individual winter sled used for travelling across frozen lakes or well-packed snow. There are race events in Northern Europe involving both dog sled and kick-sled competitions. The rigid frame is made of aluminum tubing, and can be folded for easy transportation by undoing 2 bolts. Newer “Max” models (shown) are 30% lighter than the older ESLA Kickspark. The standard runners are made of zinc-coated steel and work best on ice and very hard impacted snow trails. Dimensions are: 4.7 mm thick by 28 mm high by 150 cm long. Plastic snow runners will clip onto the standard runners, helping to support your Kickspark on less impacted snow trails. Plastic runners are popular among people using the Kickspark to train sled dogs. 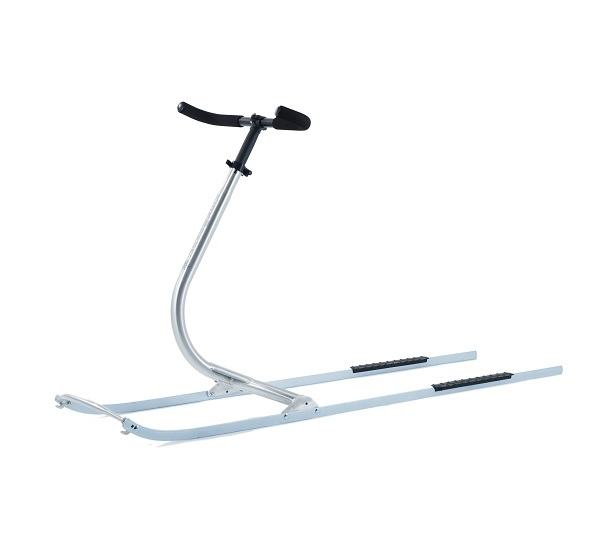 Ice Runners are the high-end racing quality upgrade on the standard steel set. Made of stainless spring steel with an alloy casing, they are lightweight, very quiet and have extremely low friction. The Kickspark world record for 100 km is 3:38:50, accomplished on Ice Runners. A specialized breakmat may be attached to the Kickspark, if desired (below). Stepping on the mat applies concentrated friction for stopping. 905-451-8497. The Kickspark with standard zinc coated runners is priced at $435. The breakmat and/or specialized runners are extra.